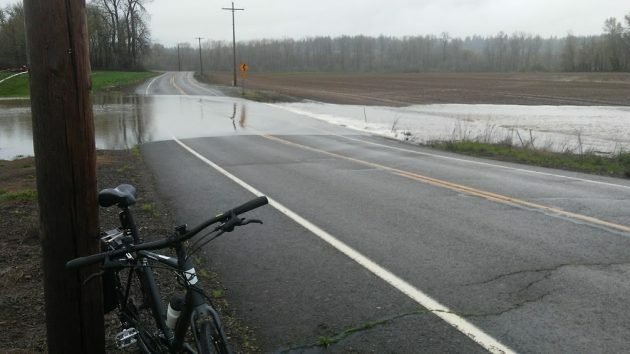 The high-water gates installed on Bryant Way came in handy today as the Calapooia River topped its banks and sent some of its flow down the floodway that cuts across the county road west of Bryant Park. Bryant Park itself also was partially under water today, something else that didn’t happen last year. Today’s flooding around the valley was a bit of a surprise because the rain of the last few days seemed like nothing out of the ordinary. At Albany City Hall, Deputy City Manager Jorge Salinas told the city council Monday the city’s preparedness team would meet early Monday to assess what if any steps, such as arranging for sites for the public to fill sandbags, should be taken. 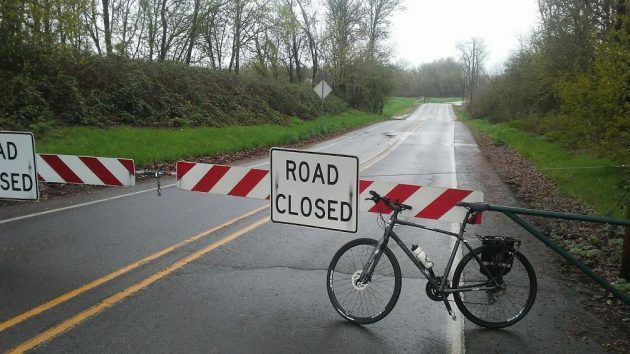 The National Weather Service said late Monday that the Willamette River was expected to crest at a little higher than 28 feet on the Albany gauge by Tuesday evening. The “minor flood stage” of the Willamette at Albany is 25 feet. … the picture changed once you got closer, which on a bike you could do. 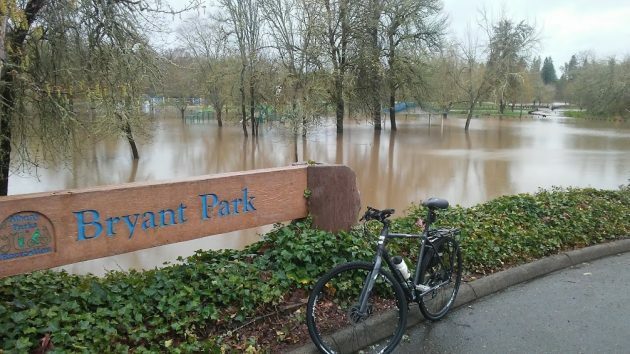 Bryant Park had its customary seasonal flood as water backed up from the Calapooia and Willamette.